The incredible story was unearthed by Chris Chatterton, the curator of the Soldiers of Gloucestershire Museum, last week. He said: ‘I was reading a book about The Glosters and I came across a mention of The Sikh. ‘I did some more digging and it really is a remarkable story. She was viewed by many men in the Battalion as an Omen of good luck. The Sikh arrived at the front line with her devoted master Lieutenant A.C. Vicary, of the Gloucestershire Regiment Vicary, and the regiment’s Second Battalion in Ypres. The Unley Museum provides an insight of life for those left behind in the inner-city Adelaide suburb during World War I through their vast collection of photographs. The In War, At Home: Unley 1914- 1918 exhibition captures the feelings of local residents during the Great War, with fascinating insights into how those at home contributed to the war effort. A feature of the display is the handwritten diary of Unley teenage school girl Dorothy Treloar. “It’s really a heart warming sight to see that this is what her take [on the war] is,” Unley Museum curator Elizabeth Hartnell said. In her diary, Ms Treloar followed the plight of local men, Ernest and Lawrence Cutts, and their younger brother Rowland. In fact, Cornellians already were participating in the war effort. In October 1914, Mary Merritt Crawford, Class of 1904, M.D. 1907, went to France to serve as a “house surgeon” in the American Ambulance Hospital at Neuilly-sur-Seine. She was commissioned a first lieutenant in the Service de Santé [health service] of the French Army and decorated for surgical work under heavy bombardment. With major anniversaries for the First World War and the Second World War coming this year, I’ve been thinking back to my recent stay in the Rhineland. A monument below my hotel window remembering Germany’s war dead still had an unused panel. My hunch is that it’ll never be used; Germany, mighty today without the help of its military, has a profound distaste for wars. As so many nations have, it rose by the sword . . . and then fell by it. All over Europe, there is little stomach for war. The motto of one military museum I visited in Vienna says it all: “War is something for museums.” And many European countries have followed this advice, creating fascinating exhibits about their military heritage. 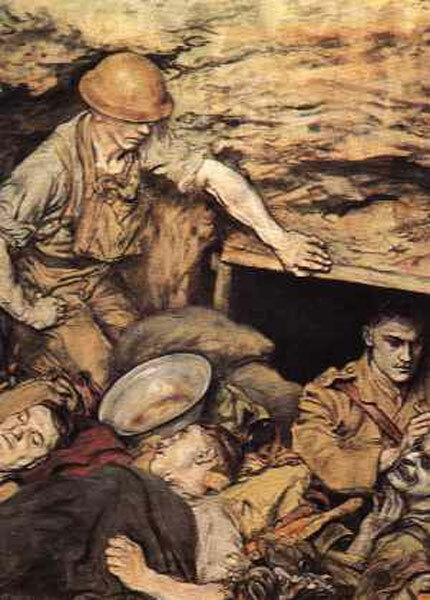 It was after his death that what the Signet magazine described last August — in a series about Writers to the Signet who died in World War One — as the story of Mrs Rodger and the fatherless child unfolded. Seven days after Mathew’s death, a baby boy was born on October 30 1916 at 2.50pm in the Royal Maternity Hospital in Edinburgh, to whom the mother gave his father’s name, Mathew Freer Rodger. The Lieutenant had a girl friend who became his fiancée and the mother of his child, and after his death she petitioned the Court of Session in Edinburgh to be declared his wife. This is how the Scotsman of Wednesday December 19 1917 reported the case under the headline ‘An Officer’s Marriage’ . . . Evidence was led in an action in which Helen Esson or Rodger, Dryden Place, Roslin, Midlothian, asked the Court to declare that she was legally married to Matthew Freer Rodger, who was a Writer to the Signet in Edinburgh, and who was killed in action while serving as an officer in the Army. Arriving in U.K. cinemas is “Testament Of Youth.” If you’re near a theater screening the flick, we urge you to check it out, and if not, we’ve got ten minutes worth clips to show you what the World War I drama delivers.